Nothing can drive you crazy like family. Whether it’s parents who always think they know best or siblings who are constantly getting on your nerves, it seems that everyone has experienced tension at home. These familial divisions aren’t a new phenomenon, they’ve been a part of human life for countless generations. “Children of Eden,” opening this week at the Ring Theatre, takes these fights all the way back to Biblical times, set to incredible music. With music and lyrics by Stephen Schwartz and book by John Caird, “Children of Eden” has undergone many revisions since its original production in 1991. Although the show has never had a Broadway production, it has become a popular choice for regional theatres all across the country. 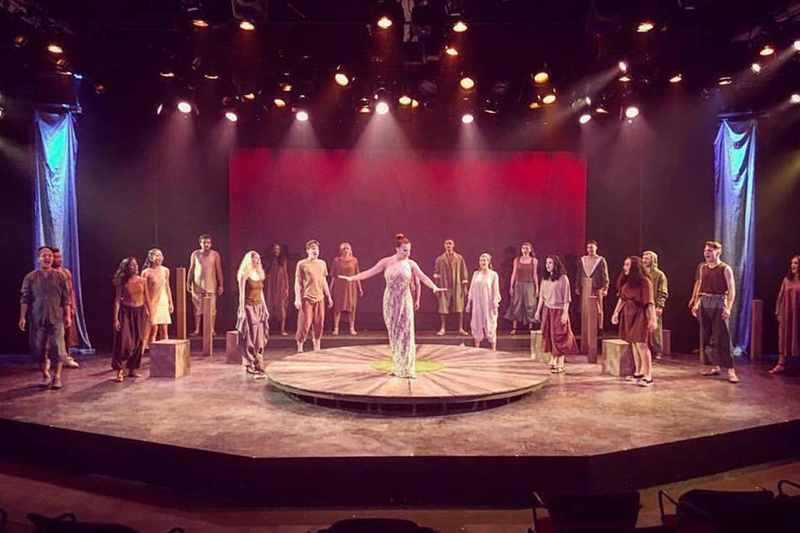 The show reinterprets the book of Genesis, including the stories of Adam and Eve, Cain and Abel, and Noah’s Ark, as the struggle of parents and children to understand one another. Rehearsals in October here at UM got off to a rough start, as the cast lost almost a full week to Hurricane Matthew. Still, the actors are optimistic about the final product. For several cast members, this is their first show at the Ring. In addition to guidance from director Greg Brown, they’ve found an opportunity to learn from their more-experienced peers. “Children of Eden” is a demanding show with more than 40 musical numbers. The ensemble cast doesn’t have much time for a break, as when they aren’t playing a named character, they all participate as members of a chorus of storytellers. For senior musical theatre major Jayne Ng, the show’s Eve, the challenge has been a welcome test of her training at UM. The designers and tech crew have pulled out all the stops for “Children of Eden,” with stage magic befitting such an epic story. “No spoilers, but the tricks the Ring Theatre has up its sleeve will blow audiences away,” Corbo said. Some potential audience members might be wary of the religious subject matter, but “Children of Eden” is much more than just a Sunday school lesson. For more information, call 305-284-3355 or visit www.as.miami.edu/ringtheatre/.